Pets in a rental car? No worries! You can easily filter cars from our search engine to see all the cars where well-behaved dogs and other pets are allowed. 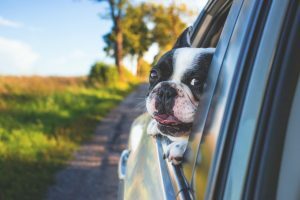 On Autolevi’s platform each car owner can choose on their car profile if four-legged friends are also welcome in their vehicle. Our team loves pets and we’re happy to see more and more cars that don’t mind your dog or cat and sometimes even offer a transportation box for your furry buddy. Always keep in mind that the safety of your pet in the car is as important as your own. Make sure it is kept securely in the vehicle and has a comfortable ride to your destination. Use a transportation box that is the right size for your pet or attach it with a special seat belt or safety harness. Treat your Autolevi car as your own, protect the car seats or clean them from pet hair and give back the car in the same condition as you got it. Finding pet-friendly Autolevi cars is easy thanks to our search engine. Go on the “Search cars” page, choose your area, dates and other preferences and under the “Accesories” tick the “Pets allowed” box. In the search results you’ll see all the vehicle that respond to your expectations and where pets are allowed. Dogs, cats and different exotic creatures have already travelled in Autolevi’s cars, mini vans and other types of vehicles. Take your pick and have fun travelling!